Senjojiki Cirque (千畳敷カール) is one of the best scenery spot located in Chuo Alps, Nagano Prefecture. It is a wide open valley that altitude is over 2,600m from the sea levels. The scenery of the Cirque is just like the Alps. It is also known as the flower land with many mountain flowers. 2. use a ropeway to Senjojiki. Senjojiki Cirque is a small bowl shape valley located on the top of Mt. Komagatake, southern Nagano Prefecture. Senjo means 1,000 Tatami mats. This beautiful scenery was created by the glacier. The bottom of the altitude is 2,600m from the sea level. In the summertime, you can enjoy beautiful mountain flowers. You can see the top of Mt. 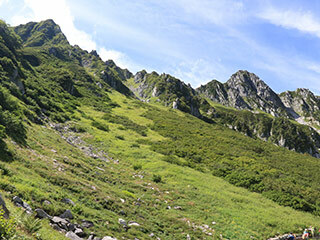 Komagatake which is the main summit of Chuo Alps, and Minami Alps with Mt. Fuji. Those views are just like the Alps in Switzerland. The round trip takes about 40 min. In the spring, you can enjoy mountain ski. The ropeway runs all through the year, and you can enjoy each season's feature of Senjojiki Cirque.